Thor wields the awesome power of thunder thanks to his--now her--hammer Mjolnir. While the original Thor was a founding member of the Avengers, a woman will now take up the mantle this fall! Not up to date on this mighty warrior? 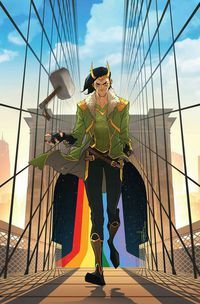 Don't worry: just take our rainbow bridge to a fantastical array of Thor comics, graphic novels, Thor clothing, statues, and much more--heck, you might even walk away with a Thor hammer of your very own. Legal Notice: Entire contents trademarked (® or TM) and copyrighted (©) 1986-2019 by Things From Another World, Inc. and respective copyright and trademark holders. All rights reserved. Page rendered at 2019-04-25 21:50:49 in 0.448 seconds.